Optical microscopy has become an indispensable tool in modern biology. The high spatial and temporal resolution and the rich molecular information offered by optical imaging have led to new discoveries in a variety of research fields. A major constraint of optical imaging is the limited imaging depth in turbid biological tissue. This talk will explore two new techniques for addressing this problem, both utilizing wavefront control to achieve unprecedented performance. 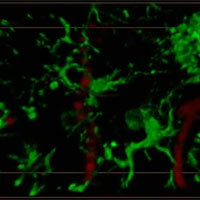 The first technique uses wavefront control to compensate for the wavefront distortion encountered in highly scattering tissue, which now enables high-resolution optical imaging through the intact skull of adult mice, as well as deep imaging in the mouse neocortex and hippocampus. The second technique use wavefront control to achieve microsecond-scale axial scanning, allowing rapid volumetric imaging. The latest in vivo imaging results will be presented. Dr. Meng Cui is a group leader at the Howard Hughes Medical Institute’s Janelia Research Campus. He has a master’s degree in electrical engineering and a doctorate in physics from the University of Michigan. His research interest is to improve the in vivo optical imaging in depth, resolution and speed, and to explore their applications in biology and medicine.